So 2015 did not go very well. After deciding to cut down on my racing schedule to peak better for my key marathons, I ended up running 2:49 in Seoul, and 2:52 in Frankfurt, which were some of my slowest marathons despite being billed as relatively fast courses. Tokyo is a relatively flat course, though I still consider it slower than the likes of Berlin and Dubai and maybe even GCAM now that I’ve done both. There were also anecdotes of the course running a little long, and the last 5km being the lumpiest on the whole course. The main appeal of Tokyo for me is the weather. It has historically been very cold, which suits me just fine. Knowing the course profile helped shape my training plan for this cycle. 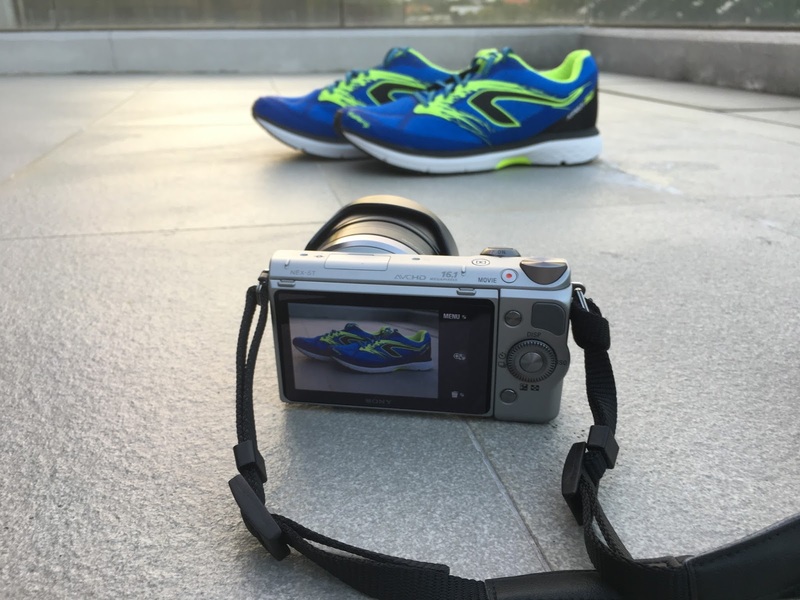 The build-up would be short; I started preparing for Tokyo in early December, knowing I had to change things up and hopefully regain some of my old running form. This cycle I focused more on doing shorter repeats with less focus on tempo efforts, and choosing to go back to more rolling terrain for my long runs. Something else I tried was doing more quality work on the treadmill where I could run at paces closer to what I would be expected to run in a cold environment. I didn’t have high hopes going into this race. I was asked on several occasions what my goal was and I honestly just wanted to get a decent time under 2:45 again. When the last 3 marathons you ran dating back to Dec 2014 were the 3 slowest of your life (2:52 in Macau, 2:49 in Seoul, 2:52 in Frankfurt) you start to question if maybe age is catching up. Furthermore, this training cycle saw some very erratic form. One week I would run very well in training, the next I would struggle to complete the long run. My interval times also seemed to be slowing from late Jan to Mid Feb. I thought it might be related to not recovering as well, since I’ll be 34 years old pretty soon, so one week I’d run 155km, then next I would run only 145km in an effort to find the right balance of volume and quality. I never got round to doing consistently high volume or consistently high quality for more than 2 weeks at a stretch, which was very frustrating for me. All these factors aligned to leave me not knowing what to expect come race day in Tokyo. After going back and forth with different race shoe options, I decided to go back to the shoe I wore for my first competitive marathon – the Nike Lunaracer+ 3. As luck would have it (or lack thereof), this year’s Tokyo marathon would be the warmest in recent memory. Many Singaporeans would disagree that it was warm, of course, but by Tokyo standards, anything above 10deg is abnormal; officially the temp was 8.7degC at the start and warming up to ~12-14deg at the finish. This, coupled with Tokyo’s strict no bottle policy meant that I was left feeling a little stressed. I had never started a marathon without running at least the first 10km with a water bottle before. Qualifying via this year’s overseas semi-elite category, we all got put into Pen A, even though there were lots of Japanese runners in Pen B with much faster PBs, in addition to a host of other star runners who flew in under the radar like treadmill WR Holder Mike Wardian, and Indonesian national runner Agus Prayogo. With that in mind I had to remind myself not to panic when B pen runners overtook me, and I should run within myself. Of course, it helps to take a conservative approach to a race. I started very conservatively this time and didn’t really pay attention to the pace on my watch as I wasn’t sure if I could trust it, what with all the tall buildings mucking with the GPS accuracy. The start was frantic, and full of drama. Within maybe 10m of crossing the start line, there was a fall and a couple of runners went down. Out of the corner of my eye I saw Andy get tangled in the bunch but he seemed not to go down hard, and I was hoping he’d catch up to me and we could settle into the early miles together. That did not materialize, and with the very competitive amateur field on the day, I was running in a big disorganized group. Needless to say this made navigation a little tricky. On a few occasions I was nudged from behind to cover up gaps ahead of me, which would have required me to run quite erratically. I tried as much as possible not to vary my pace, and let the faster runners through. I’d recently read Meb for Mortals, and one of the things that struck me was the part about letting the pace come to you naturally, and this was something I recited to myself constantly during the race. Don’t cover unnecessary moves, run within yourself, watch your breathing, and let the pace come to you. I think I only made one hard surge around the 16km u turn where there was a bit a head wind and the field had just (finally) started to thin out and I took a calculated risk and latched onto a runner 20m in front of me to shield me from the wind. Most of the time I was content to run my own race, whether it meant fighting the few spots of wind alone, or running tangents when everyone else decided to run wide. My concerns regarding the course running long were well- founded in the end. I had set my watch to auto-lap every 5km, and I manually lapped at every 5km course marker, so that the discrepancy would not grow too much. I found that I was consistently going an extra 100m by GPS for every 5km covered. Simple math meant this added up to an extra 800m, not a good thought to have in your head during a race. Distance notwithstanding, the water stations were well thought out and very long and well demarcated. I made sure I got at least one cup of Pocari, and 1-2 cups of water every 5km, and at least 1 cup of water at the intermediate stations where no isotonic drinks were available. By the 15m mark I was pouring water on my head to keep myself cool. If you think this was extreme for <15deg weather, realize that I was told the 38km medical tent was very busy with runners needing drips for dehydration! After the race I got a pretty decent sunburn. One thing I found interesting about this race was the lack of a gel station, and I was glad I carried enough gels to last my race. I couldn’t tell you much else about the course except there were quite a few curves and turns, and in some areas the road camber really caused some hot spots to build up in my feet. After the 30km mark I tried to pick up the pace a little, but the last 5-7km were also more rolling and just when I thought the last incline was done and dusted, there was one last annoying rise at the 41km mark where I really felt my rhythm sapped. The good news is I don’t think I got passed by anyone after 35km. In fact I was picking off lots of runners who were starting to fade. Overall my plan to run a conservative pace paid off and I managed a nice consistent even split even though the second half of the race is significantly slower than the first. Based on the actual race distance markers I ran the first half in 1:22:00, and the second half in 1:22:10. 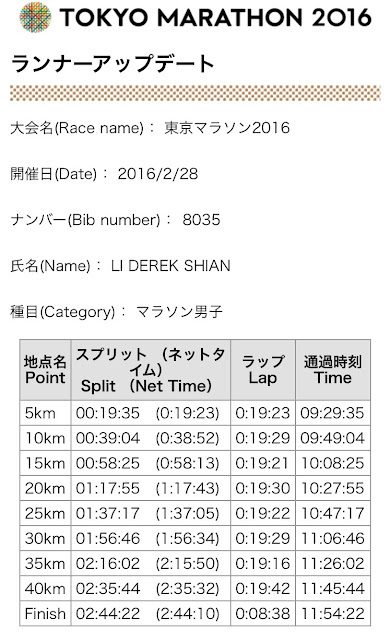 Comparing this race to my PB race in Boston using the GPS data, I ran Boston in 3:49 ave, and Tokyo in 3:51. My stride length was identical in both races, and my cadence also almost identical; I averages 194 step per min (spm) in Boston and 193spm in Tokyo. Considering the less than optimal build-up to this race, and the lacklustre form of 2015, I was more than happy to meet my primary objective of going under 2:45 which will get me guaranteed entry to next year’s Berlin marathon. Incidentally my time nabbed me 404th overall. I would really have liked to have taken a photo with Mike Wardian (and the Hoka Tracers he wore) but he was nowhere in sight in the post race changing area. Probably long gone. As my wife Grace put simply, "next time just run faster."